Rumor has it that Honda and Kawasaki were working on their four-cylinder superbikes at the same time, shrouded in secrecy. When Honda beat them to the market, Kawasaki made a bold decision: instead of being an also-ran, they would bide their time and release the bigger, badder machine. So, in 1973, they unleashed their Z1 upon the unsuspecting public. With 903cc’s and 82hp, the bike may have come late to the market, but it was surely the more powerful machine. It handled reasonably well, a giant step forward from Japanese streetbikes from the 60’s and early 1970’s and “did the business” in a straight line. 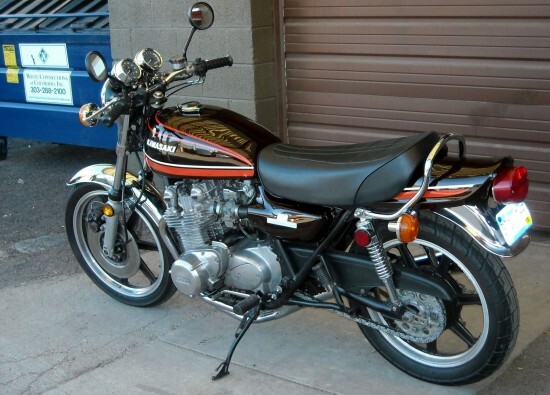 Big, brawny, and reliable, the Z1 and it’s competitor the Honda CB750 spelled the end of European big-bike dominance. Their mass-produced reliability has led to a certain ubiquity. The “UJM” or “Universal Japanese Motorcycle” was defined by these bikes. Four cylinders, five speeds, twin shocks, no fairing. 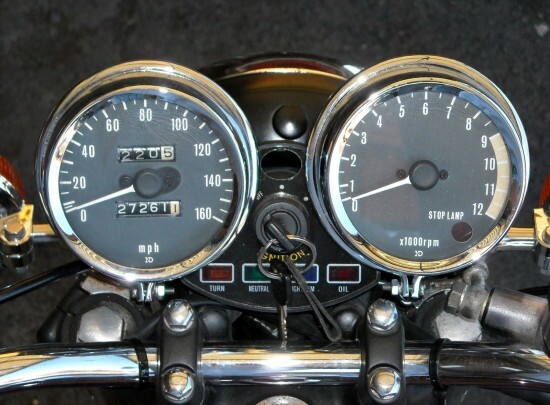 And with that ubiquity came a certain disregard: it’s amazing how many relatively poorly performing or simply poorly selling motorcycles have been lionized in the decades after, as “rarity” has come to equal “value”. But, while Z1’s may have been manufactured in great quantity, so many Z1’s have been poorly treated and maintained that good ones have become desirable as their classic status is recognized. 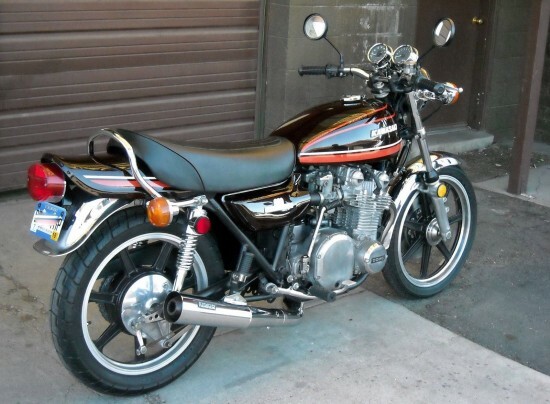 This is a matching numbers bike per Kawasaki specs, Z1F29721 and Z1E29735. The mileage is low at 27,261 miles. This bike is in running condition but it sits for long periods so may need tuning. Here is a list of the work performed in the last year or so; the carbs were rebuilt with new jets, needles and gaskets less than 100 miles ago, new front and rear tubes/tires, new air filter assembly, new air filter, brake caliper rebuild kit, master cylinder rebuilt kit, new clutch and brake levers, new sprockets and chain, new throttle cable, new speedo and tach cable, new turn signal lenses, new short signal stems, new side cover emblems, new foot rubbers, new shifter peg rubber, new gas cap, new brake and clutch cable, new shocks, new paint job with paint striping (not decals) and at the time a Kerker exhaust that had less than 150 miles or so on them and taken off back in the day. There are 2 things I would recommend, one is a new gasket/seal at the tach drive in the front of the engine, it leaks a little, and the other is a float bowl adjustment in the carbs. This bike is very clean and in great condition but it is not perfect. There is some minor pitting on the front forks and the kickstart lever. There are some period correct mods that have been done like the Lester rims (18 inch rear and 19 inch front), Euro style low rise bars and Kerker exhaust. 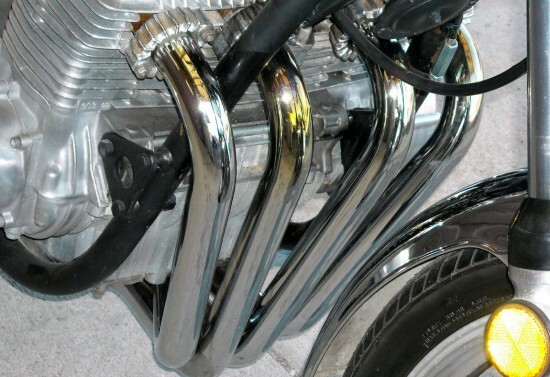 The exhaust is the pre 1983 Kerker exhaust with the small logo and in very nice condition. The correct tool kit and owners manual are included and in great condition. The seat is a new replacement from Z1parts. The oil tank is not on the bike. 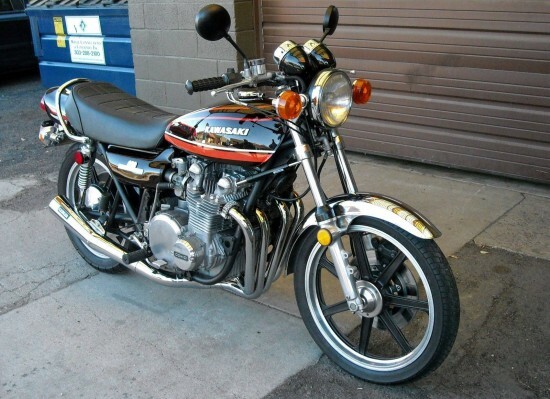 The Kawasaki Z1’s are definitely attracting collector notice these days, and while this one isn’t perfect, it looks like a great one to ride and enjoy while you’re waiting for values to appreciate to a point where a restoration makes sense. Just grab that platinum credit card and give Bull Dock or AC Sanctuary a call! Dang. That one pushed all the right buttons. Very nice looking specimen!